Hu Songwen: "The principles of hemodialysis aren't complicated." An impoverished uremia patient has moved the public by constructing his own hemodialysis machine to stay alive. Doctors agree it's a miracle that Hu Songwen has survived for 13 years because of his homemade hemodialysis machine. The man recalls his life fell apart when he was diagnosed with uremia in 1993. He was a 21-year-old Nanjing Institute of Meteorology senior. That morning, his face swelled. He had difficulty urinating. And he couldn't even stand on his own. A medical examination showed both of his kidneys had failed. The institute paid Hu's expensive medical bills for a year. It then sent him home to Qutang township in Jiangsu province's Hai'an county. 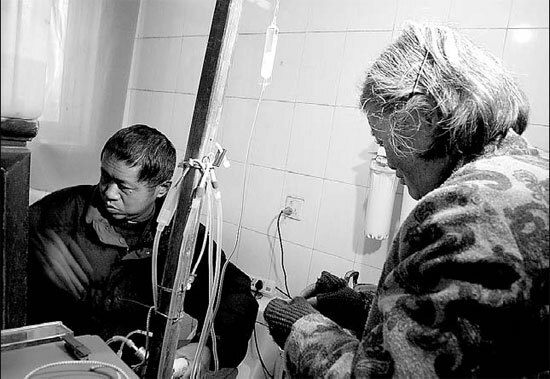 Hu's parents were factory workers, but each hemodialysis session cost 400 yuan ($64). At that time, his parents earned less than 1,500 yuan a month, but Hu needed more than 4,000 yuan every month to live. The parents had done everything possible to save their son. In less than a year, they sold all their valuables and borrowed money from all of their relatives. After the money from the government and Hu's friends were spent, they couldn't afford food or housing. "Do nothing but wait for death?" Hu says. After reading books about the principles of hemodialysis, Hu - who excelled at chemistry and physics in high school - bought a cheap secondhand blood pump online and asked an acquaintance to purchase hemodialysis tubes. "The principles of hemodialysis aren't complicated," Hu says. "I had confidence I could overcome the difficulties I'd face." On March 31, 1999 - a day he says he'll never forget - his homemade hemodialysis machine, filled with purified water and drugs, started to operate in his home's bathroom, which is smaller than 5 square meters. Every tube used for hemodialysis costs about 100 yuan. To save money, Hu uses each more than 10 times, while they're only used once in hospitals. He doesn't share the fears of many people around about bacterial infections and pollution. "I just need to master the drug dosages and make sure to avoid getting any air in my veins," he says. He used ceramic bowls to pour purified water into a steel pot, and heats the medicine in the microwave. His 81-year-old mother, Huang Zhongfang, is his only hemodialysis assistant. She uses an old wooden scale to measure the fluid with her trembling hand and then feeds it into the machine.